When I was in Year 6, the class had an excursion to Canberra but I missed it because I was in the USA. 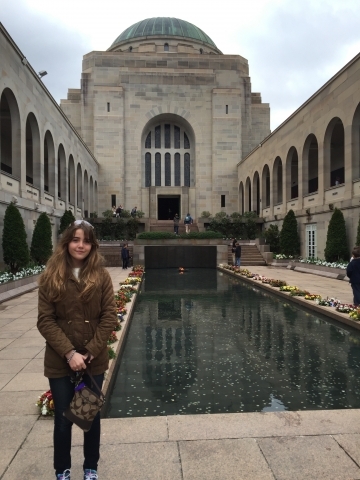 While my classmates visited Parliament House, I visited the Capitol Building in Washington; they visited the War Memorial and I visited the WWI and WWII memorials in Washington. I loved visiting these amazing places, but the kids said Canberra was so fantastic that I always felt I missed something special. Two weeks ago I made my very first trip to Canberra; we were only there for 2 days so I wanted to pack as much into the time we had as I could. One thing that I noticed straight away is that Canberra is so much like Washington, but on a smaller scale. The monuments are huge, the gardens are beautiful and the design of the city makes everything so accessible that you really can squeeze a lot into one day. Parliament House is absolutely HUGE! There is so much to see that you really need to take the tour. The guides are so informative and make the building come to life with stories you won’t find in a brochure. I finally worked out what the difference is between the House of Representative and The Senate! Don’t forget to have a look at the Magna Carta which is housed at Parliament House- it is amazing. Make sure you go up onto the roof and stand beneath the flagpole; it is 81 metres high and 220 tonnes and you can see it for miles! Questacon has been on my bucket list for years and it was everything I wanted it to be. There are so many cool science experiments to amaze you but my personal favourite was the Lightning Cage. You will need to line up for the earthquake lab but it is worth the wait. One of the things that might frustrate you is the adult’s who hog the exhibits- I can’t blame them for wanting to have a go at the exhibits but it would be helpful on busy days if there were time limits so everyone can have a go. The Spiders exhibit is on display until the 9th October, so try to get your visit in before then if you want to see some hairy spiders up close and personal. The National Museum of Australia is in a really cool building and has so many fantastic exhibits from the pioneering days of white settlement to the Aboriginal and Torres Strait Islander programs. There were many sad stories of hardship and separation but lots of stories of healing. I was inspired by the words Nganimparlu kapurnalu-jana manngu-nyanyirni taarnngangku-juku. Ningla-a-Na is translated as 'we are hungry for our land'. Canberra has beautiful parks and bike tracks around Lake Burley Griffin and the shopping and food is amazing. Try your hardest to talk your parents into letting you try the Freak Shakes at Patissez – they are unbelievable! My 2 days in Canberra were so jam packed that I really didn’t get time to do all the things I wanted to do- so I am conning mum and dad into taking me back very soon. From a kid’s perspective, Canberra is a very informative place to visit but also balanced with lots of fun things to do to give your brain a rest. You can try so many different nationalities of food and shop til you drop if that is your thing, whatever you do to relax, you will find it in Canberra.